Twenty-six members of the Pitel family of Parczev, Poland, gathered for a photo in 1938. Yerachmiel Yosef (Josef) Pitel moved to Israel shortly after this photo was taken. In 1943 the entire family was murdered in Treblinka. Yerachmiel Yosef was the only survivor. Yerachmiel Yosef Pitel, (first on the right), one of ten children (six sons and four daughters) left his home town of Parcew, Poland in 1938 and went to Israel. Before his departure, the Pitel family got together for a family photograph. 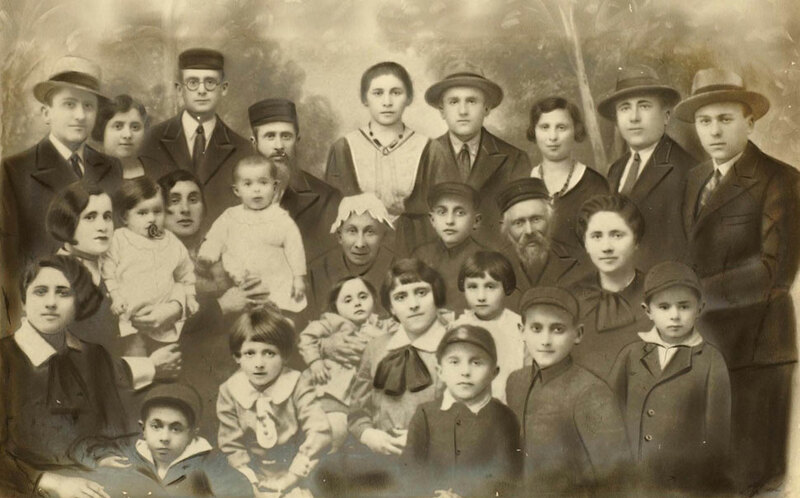 The photograph portrays the parents Chaim and Ester, their ten children, three daughters-in-law, one son-in-law and eight grandchildren, as well as Yosef’s 95 year-old paternal grandfather Leibish Pitel, and his 70 year-old maternal grandmother Sarah Eidelman. Yosef Pitel kept the photograph during his lifetime, and it was given to Yad Vashem after his death. Pages of Testimony were submitted to Yad Vashem by Yosef and another relative in memory of each member of the Pitel family. The Pages and a brief biography can be seen by clicking on the image of each person appearing in the photo. The family name is spelled two ways here - reflecting how it was spelled by the submitter of the Page of Testimony. Photograph taken by Kielecki in Parcew, 1938. The photo was donated to Yad Vashem by Yosef Pitel’s children, Yisrael and Ashira Pitel, Esther (Pitel) and Tommy Lamm, and Meir and Tzipi Pitel. Yerachmiel Yosef Pitel was born in Parcew, Poland. 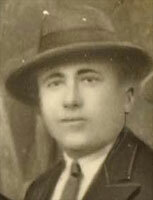 The family photograph was taken on the eve of his departure to Eretz Israel in 1938. Yosef is the only member of the Pitel family who survived the Holocaust. He submitted Pages of Testimony in memory of all his family members. 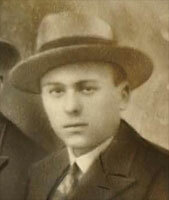 Mosze Baruch Pitel, Yosef’s oldest brother, was born in Parcew in 1901. He was married to Chaya Hinda Adler, and was a shoemaker by trade. They had four sons and a daughter (four of the children appear in the photograph). Mosze Baruch was murdered in Parcew by Polish neighbors. View the Page of Testimony submitted in his memory. Chaya Hinda Pitel (née Adler) was Mosze Baruch's wife and Yosef's sister-in-law. The mother of five (four of the children appear in the photograph), she was 40 years old when she perished. Chaya is included in the Page of Testimony in memory of her husband. View the Page of Testimony submitted in their memory. 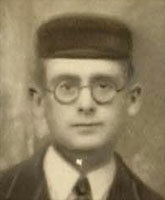 Welwel (Ze'ev) Lejzer Pitel, Yosef's brother, was born in Parcew in 1902. He was married to Leah Guberman and they had three daughters – Doba, Masha and Sarah (Doba and Masha appear in the photograph). Welwel Lejzer was murdered in Parcew by Polish neighbors. Leah Pitel (née Guberman) was Welwel Lejzer's wife and Yosef's sister-in-law. The mother of three girls – Doba, Masha and Sarah – she was 39 years old when she perished. (Doba and Masha both appear in the photograph). Leah is included in the Page of Testimony in memory of her husband. 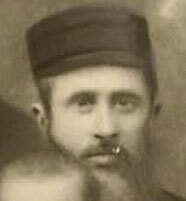 Chaim Israel Pitel, the head of the family, was born in Parcew in 1881. He was married to Ester (née Eidelman) and they had ten children, six boy and four girls. They also had twelve grandchildren, several of whom appear in the photograph. 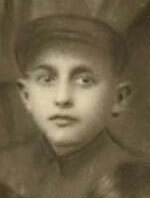 Chaim Israel was murdered in the Treblinka death camp in 1943. Leibel (Arieh) Len, Yosef's brother-in-law, was married to his sister Chaya Hudes. The father of two girls, Masha and Doba (not in the photograph), he was murdered in the Treblinka death camp. 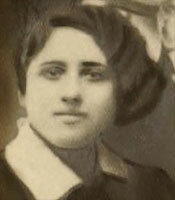 Chaya Hudes Len (née Pitel), was Yosef's sister and Leibel Len's wife. She was born in 1910 in Parcew. The mother of two girls, Masha and Doba (not in the photograph), she was murdered in the Treblinka death camp. View the Page of Testimony submitted in her memory. 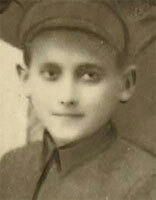 Mordchi Zemach Pytel was born in Parcew in 1909. He was married to Gittel, and they had twin daughters, Doba (or Yehudit, according to a different Page of Testimony ) and Miriam (both in the photograph). He lived in Warsaw, and was a shoemaker by trade. 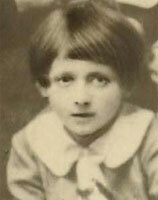 He perished in Warsaw together with his family in 1943, at the age of 34. Gittel Pytel was Mordchi Zemach's wife and Yosef's sister-in-law. They had twin daughters, Doba (or Yehudit, according to a different Page of Testimony) and Miriam (both in the photograph) and lived in Warsaw. 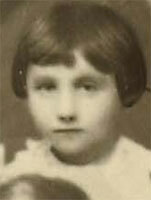 Gittel perished in Warsaw together with her family in 1943, at the age of 30. Gittel is included in the Page of Testimony in memory of her husband. Doba (Zissel) Lerner (née Pitel), was born in Parcew in 1914. She married Yosef Lerner after this photograph was taken, and they had no children. Yosef Lerner fled to Eretz Israel, but was unable to bring his wife there. Doba was murdered in the Treblinka death camp in 1943. Yosef Lerner later remarried, raised a family and lives today in Hibat Zion. Azriel Meir Pytel, Yosef's youngest brother, was born in Parcew in 1928. He was murdered in the Treblinka death camp in 1943. 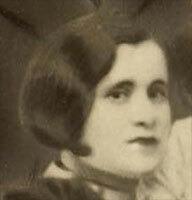 Rochel Leja Pytel, Yosef's sister, was born in Parcew in 1918. She worked as a housekeeper. 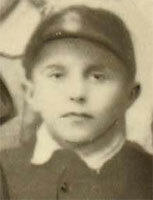 Rochel Leja was murdered in the Treblinka death camp in 1943. Dwora Gele Pitel, Yosef's sister, was born in Parcew in 1922. She worked as an office clerk. 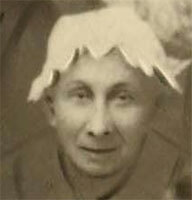 Dwora was murdered in the Treblinka death camp in 1943. 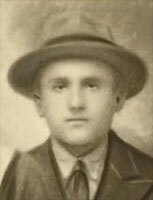 Szloma Gecl, Yosef’s younger brother, was born in Parcew in 1925. He was murdered in the Treblinka death camp in 1943. 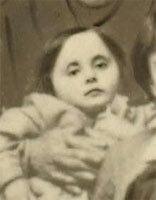 Masha Pitel, Welwel Lejzer's middle daughter and Yosef's niece, was born in Parcew. She was murdered in the Treblinka death camp in 1943. She was eight years old. 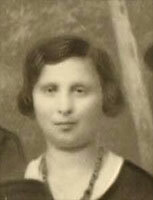 Doba Pitel, oldest daughter of Welwel Lejzer and Yosef's niece, was born in Parcew. She was murdered in the Treblinka death camp in 1943. She was ten years old. Masha Pitel, Mosze Baruch's daughter and Yosef's niece, was born in Parcew. She was murdered in the Treblinka death camp in 1943. She was four years old. Masha is included on the Page of Testimony in memory of her father, submitted by relative Yosef Bermatz. Getzil Pitel, Mosze Baruch’s eldest son and Yosef’s nephew, was born in Parcew. He was murdered in the Treblinka death camp in 1943. He was ten years old. Getzil is included on the Page of Testimony in memory of his father. Shimon Pitel, Mosze Baruch’s second son and Yosef’s nephew, was born in Parcew. He was murdered in the Treblinka death camp in 1943. He was eight years old. Yitzchak Pitel, Mosze Baruch’s third son and Yosef’s nephew, was born in Parcew. He was murdered in the Treblinka death camp in 1943. He was six years old. Yitzchak is included on the Page of Testimony in memory of his father. Mordchi Zemach and Gittel Pytel had twin daughters, Miriam and Doba (or Yehudit, according to a different Page of Testimony). They were born in Warsaw, where they perished together with their parents in 1943. Both twins appear in the photograph – this is one of them. They are included in the Page of Testimony in memory of their father. 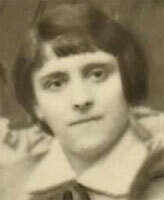 Ester Pitel (née Eidelman), the mother of the family, was born in Parcew in 1887. The daughter of Getzil and Sarah Eidelman (who also appears in the photograph), she was married to Chaim Israel and had ten children. She was murdered in the Treblinka death camp. 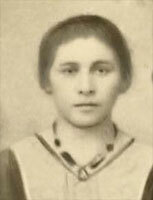 Sarah Eidelman was Yosef's maternal grandmother. It is unclear as to whether she perished in the Holocaust or died earlier. Leibish Yehuda Pitel, 95, was Yosef's paternal grandfather. It is unclear as to whether he perished in the Holocaust or died earlier.